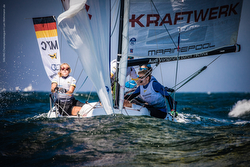 (Berlin, Germany)- The second round of the German J/70 Youth Sailing League took place on the Wannsee lake in Berlin. Despite summer holidays all over Germany, there were 20 passionately enthusiastic youth teams on the starting line, happily hosted by the Berlin Yacht Club. The sailors were fortunate that forecasts for 8 to 15 kt winds from the west provided the best sailing conditions they could expect on the Wannsee for two days. As a result, it made for great sailing on Saturday but Sunday’s had to be canceled since the wind died and turned the lake in a complete “glass out”. Winning the abbreviated event was the Munchner YC with a 1-2-1-1 for 5 pts. Second was the Bayerischer YC 2 team with a 1-1-4-1 for 7 pts. Then, third was the One Kiel Team with a 2-5-2-1 with 10 pts. Sailing photo credits- Lars Wehrmann. Follow the German J/70 Youth Sailing League on Facebook here. For more German J/70 Youth Sailing League information Add to Flipboard Magazine.